Bernie Sanders campaign is based on Wall Street corruption and Big Business not paying enough tax…Yet he supports Not for Profits in this country that are more corrupt than Wall Street especially HSUS where he has co-sponsored several bills that will have a major impact on the lives of US citizens and American culture to live by the US Constitution and the Bill of Rights for Life, Liberty and PROPERTY!!! 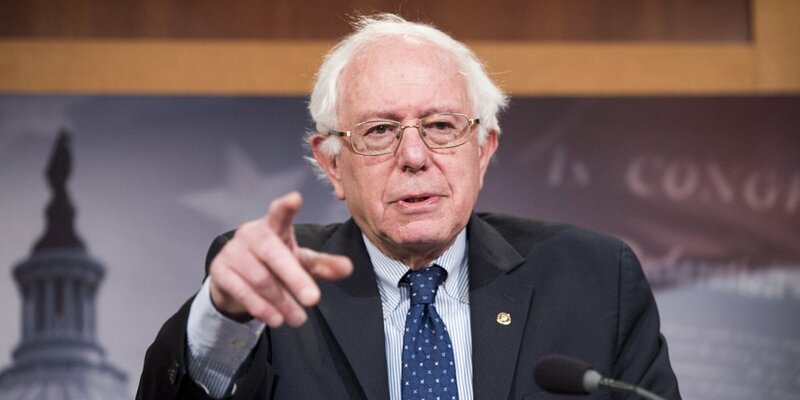 If you support the CORRUPT agenda of Socialist Bernie Sanders then you are supporting the corruption of a Fanatical Animal Rights Terrorist that not only lives within our borders but is an ANTI-American leader who has been in the Senate for years and now running for President of the United States. If all that the Democrat party has to offer is Bernie Sanders and Hillary Clinton then it’s time to leave a party that accepts UN Agenda 21/203o, supports allowing Not for Profits that pay no tax on MILLIONS and more corrupt that Wall Street then it’s time to leave a party that does not support the Constitution and the American Culture!!! Remember the Fanatical Animal Rights Agenda wants to end ALL relationships with people. Animal Welfare or Animal Rights? As Animal Welfare advocates. . .
· We seek to improve the treatment and well-being of animals. · We support the humane treatment of animals that ensures comfort and freedom from unnecessary pain and suffering. · We believe we have the right to “own” animals — they are our property. · We believe animal owners should provide loving care for the lifetime of their animals. As [Fanatical] Animal Rights [Terrorists] Activists . . .
· They seek to end the use and ownership of animals, including the keeping of pets. · They believe that any use of an animal is exploitation so, not only must we stop using animals for food and clothing, but pet ownership must be outlawed as well. · They want to obtain legal rights for animals as they believe that animals and humans are equal. · They use false and unsubstantiated allegations of animal abuse to raise funds, attract media attention and bring supporters into the movement. Now, How about a look at Bernie’s record -Let’s see if you would still support him after seeing his record…If you do then you are supporting Animal Rights NOT Animal Welfare!!! Big Cats and Public Safety Protection Act- Would prevent the breeding and possession of big cats (cougars, lions, leopards, jaguars, cheetahs and lion/tiger hybrids), while still permitting accredited zoos and wildlife sanctuaries to operate in the important conservation and welfare role that they currently play in the United States. Private citizens who currently own big cats will still be allowed to own them, but will be required to register their animals if this legislation is signed into law. Puppy Uniform Protection and Safety Act- Would ensure breeders and pet store owners provide dogs with living spaces that are clean, spacious, and are free of infestation by pests or vermin. The legislation would also require that the health of these dogs be monitored by a veterinarian and would ensure that the Animal and Plant Health Inspection Service has adequate authority to close loopholes that allow domestic puppy mills to continue operating in the United States. Safeguard American Food Exports Act- Would permanently prohibit the slaughter of horses for human consumption in the United States, as well as the transportation of horses for slaughter overseas. Captive Primate Safety Act- Would make it unlawful for a person to import, export, transport, sell, receive, acquire, or purchase a live animal of any prohibited wildlife species in interstate or foreign commerce. Egg Products Inspection Act- Would phase out the use of battery cages for egg laying hens in favor of enriched housing that allows chickens room to move, and includes perches, nesting boxes, and places to scratch. It would prohibit forcing new laying cycles by withholding food or water and making sure the ammonia levels from manure are kept low. Animal Fighting Spectator Prohibition Act- Would amend the Animal Welfare Act to impose criminal penalties for deliberately attending or encouraging anyone less than 18 years of age to attend an animal fighting venture. Prevent All Soring Tactics (PAST) Act- Currently, under The Horse Protection Act, owners and caretakers who are found guilty of participating in soring may be disqualified from participating in any aspect of equestrian competitions for up to a year and can be fined up to $3,000. The PAST Act would ban the use of soring devices and strengthen penalties for violations of the Horse Protection Act. Additionally, Sanders signed onto the Senate Horse Slaughter Defund letter that was sent to the Subcommittee on Agriculture, Rural Development, Food and Drug Administration, and Related Agencies during April of 2014. He also signed onto a letter to Director Collins about the Council of Councils Working Group on the Use of Chimpanzees in the NIH-Supported Research Report during this session of Congress. All are HSUS/PETA/SPCA supported/sponsored bills that have nothing to do with Animal Welfare…So, it seems that good old Bernie is a Fanatical Animal Rights Terrorist and as a Socialist, is in agreement with and accepting the policies of Agenda 21/2030 that will destroy our American way of life and culture du to his support of CORRUPT Not for Profits. Our animals are our property and do not take president over the lives of people. Our constitution was written concerning people not animals. Please consider or reconsider who you support by what you support. ~ by topcatsroar on February 11, 2016. It’s better than seeing a presidential candidate kneeling down next to a Tiger skinned rug (Ted Cruz), or a picture of a guy trying to hold up a dead Tiger to pose for a picture and have his dad brag about it (Donald Trump). When did this society get so hell bent on killing endangered animals? And these so called men want to be president? Omg its a travesty that these ungracious, self absorbed, uneducated men are in any position to possibly become elected. Im totally disgusted by the horrors of men and their insatiable desire for power,control, and fame. And they wonder why there are so many killers out there? Take a look around. Our own politicians are advocating killing. What do you expect would happen? That we would all sit around a bonfire singing Kumbaya? Not likely. By backing Sander’s you are supporting more laws that don’t do a damn thing to help a single animal and criminalize people…And Trump’s son did not kill a tiger to the best of my knowledge-Yes he did kill an animal on a LEGAL hunt designed for conservation. I haven’t seen a picture of Ted Cruz and a tiger skin -no links to pics provided but if it was a legal hunt then we have no call to complain about it-period. You want to have a pet and support animal ownership then you must support all animal usage. You can’t pick and choose these days when there are a Fanatical Animal Rights Terrorists Hell-Ben to end all human relationships with animals especially when an organization such as HSUS/PETA/SPCA, etc. is out there creating laws that will prevent ownership or make owning an animal a dangerous thing…Owning man’s best friend should not equate to animal abuser-“One generation and out!” -Wayne Pacelle, CEO HSUS. Besides all that if you don’t realize what Socialism is then do a bit of research-it doesn’t work and considered a failure. Are you nuts? Animals do not have rights and never will-Having a registry in TN has nothing to do with giving animals rights but instead it takes away rights from people. I do not defend intentional cruelty or approve of it. There are very few intentional cruelty cases which means there are very few felonious convictions. Those would be dog fighting and other intentional crimes as written by law as a felony. This is no step closer to giving any animal rights-People convicted of a felony loose their rights in this country no matter the crime…So get over yourself and know that this means one more step taking away rights granted to US citizens…It does nothing to help a single animal.